Columbia University Press, 2008. pp. 456. ISBN: 978-0-231-14343-1 (paper); ISBN: 978-0-231-14342-4 (cloth). Wang Anyi is widely considered to occupy a prominent position among contemporary Chinese writers. Throughout the past three decades, she has consistently produced work that has met with critical acclaim, and in China she has a large, dedicated readership. Her work has also been widely translated into English, with the first translations dating back to the early 1980s. Despite all this, English-language scholarship of her work seems to lag behind somewhat in comparison to studies of other writers of comparable status, such as Mo Yan and Yu Hua, with most scholarly work devoted to her fiction dating from the late 1990s to the present. Arguably, this has to do with the fact that having started out as an author famous for her realistic stories about rusticated youth, Wang re-invented herself in the early 1990s and, in the words of Jiwei Xiao, “began to experiment with a highly subjective narrative method and ‘atypical’ characters.” At the pinnacle of these experimental works stands her 1995 novel Changhen ge, which was awarded a Mao Dun Prize in 2000, and which is now available in English translation by Michael Berry and Susan Chan Egan, under the title The Song of Everlasting Sorrow: A Novel of Shanghai. 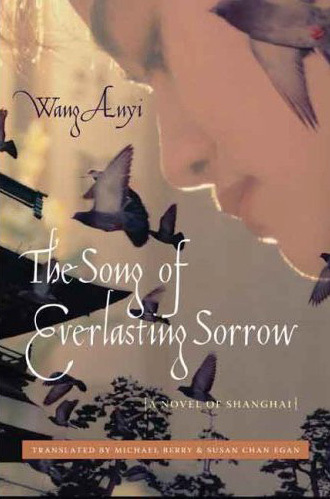 The addition of a subtitle (“A Novel of Shanghai”) to the original Chinese title is a logical choice: the city of Shanghai, with its ups and downs during the tumultuous period from the post-war 1940s to the 1980s, and the firmly articulated cultural identity of its citizens, stands out as the major structuring principle of the novel. In many ways, the novel is a textbook example of “city literature” in the full meaning of the term–i.e., not just writing about the City, but writing that through its style and organization expresses a distinctly urban epistemology. The opening chapters of the novel (respectively entitled “Longtang” and “Gossip”), together constituting the most sustained literary declaration of love for Shanghai I have ever read, set up this structure in no uncertain way. Shanghai is a unique city, whose essence is to be found not in the grandiose edifices of the semi-colonial era, but in the maze of alleyways (longtang) that lies behind them, “in a series of dots and lines” (3); not in its official discourses, but in the gossip that ceaselessly buzzes around its inhabitants. 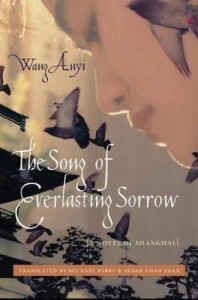 Much of the power of the narrative that follows these opening chapters comes from Wang’s consistent development of these two tropes: the novel, like the City, develops along complex lines, with here and there accentuated dots, while information (about the characters, about the historical context) filters through to the reader in a steady stream of gossip-like description and dialogue. Wang Anyi leaves no doubt that she wishes to gender the city of Shanghai as female. The emphasis throughout the novel is very much on female characters and their friendships, and clear links are suggested between the complex, gossipy nature of the City and the nature of women. Wang sets up Shanghai women as different from and possibly alternative to the dominant discourses of Beijing men, on every possible level, from the stylistic to the ideological, although the comparison is not explicit: the dominant discourses coming from Beijing, namely those of politics and revolution, are only present in the background. However, this does not make their impact less pungent for the Chinese reader, nor for the western reader aware of what took place in China during the second half of the twentieth century. In this scheme of things, relations between men and women are described, especially in the first part of the novel, set in the late 1940s, as near-cynical negotiations, sometimes portrayed as “battles,” in which successful women become wives and less successful ones strive to get the best deal as concubines, kept in luxury apartments by powerful men. When reading Part I of the novel, and especially when considering the aspects touched upon above, it is difficult not to think immediately of the work of Eileen Chang. From the notion of gossip (in Chinese liuyan, the famous title of Zhang’s collected essays), to the bitterly biased, anti-romantic narrative voice, to strong emphasis on fashion and descriptions of (women’s) clothing, to the complex, battle-like love affairs between women and men whose involvement in relationships is always in part based on ulterior motives, and of course to the setting in 1940s Shanghai, the influence of Chang is unmistakable and undeniable. This also extends to the heroine of the novel, Wang Qiyao (with a distant echo, at least in pinyin, of the sounds of the name of Chang’s famous heroine Cao Qiqiao). Wang Qiyao achieves fame in Shanghai high society in 1946 by coming third in a Miss Shanghai beauty pageant. As with many of Eileen Chang’s protagonists, Wang Qiyao’s beauty is understated and natural, intangible to an extent, needing to be “discovered” (in this case by a photographer, Mr. Cheng, who is the first man in the novel to become smitten with Qiyao). And as with many of Eileen Chang’s protagonists, she ends up in a relationship based as much, if not more, on calculation than on affection: she becomes the kept woman of an influential figure in the local Nationalist regime. She is set up in a luxury apartment (the description of how she walks through the empty rooms as she first enters the apartment is reminiscent of Bai Liusu’s first entry into the empty house provided for her by Fan Liuyuan, toward the end of Eileen Chang’s “Love in a Fallen City”) and that is where she stays until 1949, when the Communists arrive and Part I ends. Wang Anyi succeeds very well in showing how life went on for many in Shanghai in the 1950s and early 1960s, but even she prefers silence when coming to the Cultural Revolution. At the end of Part II, a long description is given of the fate of Mr. Cheng, who was “among the first batch of people to commit suicide in the summer of 1966,” but after that there is silence. Part III begins in 1976, with the revival of Shanghai, characteristically described by Wang not in terms of political changes, but in terms of the appearance of better films in the cinemas and more stylish clothes in the shops. In Part III, the relationship between Wang Qiyao and various members of the younger generation, especially her daughter Weiwei, is central. The new generation is portrayed as indulging in materialism and, eventually, in nostalgia about the old Shanghai, which leads to an unexpected return to popularity for Wang Qiyao, who becomes a frequent guest at parties for younger people living the new Shanghai dream, and fascinated by their acquaintance with a genuine “Miss Shanghai.” A tender relationship between Qiyao and a young nostalgic precedes a somewhat abrupt ending, in which Qiyao is strangled by the swindler Long Legs, who comes to steal the bars of gold that Qiyao has (implausibly, it would seem to me) managed to hold on to since the 1940s. She is left to die on her bed, in an echo of a scene in Part I. Although a number of critics, including Michael Berry himself in the Afterword to the translation, have pointed out that the ending is melodramatic on purpose, to provide, in Berry’s words, “a tragic climax that echoes the films of her youth,” I find it ever so slightly contrived. Nevertheless, that Wang Qiyao must meet a tragic end was always beyond doubt, or will have been for most Chinese readers, assuming their familiarity with the famous poem by Bai Juyi that gave the novel its title. In Bai’s “Song of Everlasting Sorrow,” the beautiful imperial consort Yang Guifei is put to death (by strangulation, of course) as a victim of political intrigue. Her death signals the end of rebellion and the return to order–and this analogy (that Wang Qiyao dies to end the rebellious rampage of the Communist revolution and herald in a better era) is perhaps the strongest political message that the author has allowed herself. She compulsively or inadvertently places herself at the apex of triangulated relationships and fails to see the pain she causes in the process. Resourceful and essentially decent, she is nonetheless unable to fully comprehend the intensity of other people’s emotions. a gentle soul [who] tugs at the heart string of ordinary men and women [and who] brings a special touch that never fails to lighten up her surroundings. “Do you ever feel that this city has aged?” he asked Wang Qiyao. The translation by Berry and Egan does justice to the novel as much as is possible within the confines of publishing translations. As they explain in their acknowledgements, they were unable to fully represent the most outstanding formal characteristic of the novel (the relative indistinctiveness of description and dialogues created by Wang Anyi through long sentences and paragraphs and the omission of quotation marks). Quotation marks and paragraph breaks were added “for the purpose of readability in English.” One might argue that this novel is “experimental” exactly because it tries to work against “readability,” or at least to make reading more of an effort, but I expect the publisher’s pressure to make the novel as “readable” as possible was not easily ignored. One might also argue that, for the western reader, there are already enough factors working against “readability,” such as references to names, places, and events, that need not (and are not) explained to the intended audience. Rather than criticizing the translators or their publishers, I would venture that such questions make the translation interesting in its own right, and a fruitful prospect for scholars working in the growing field of Translation Studies. I certainly enjoyed reading this novel very much and, as a non-native reader of Chinese and as someone who finds the Chinese original very difficult to read, I readily admit to being delighted that this translation is available. The MCLC Resource Center bibliography lists 16 items for Wang Anyi, 26 for Yua Hua, and 29 for Mo Yan. Jiwei Xiao, “Can She Say No to Zhang Ailing? Detail, Idealism and Woman in Wang Anyi’s Fiction.” Journal of Contemporary China 17 (56) (2008), 514. New York Times (May 4, 2008; Sunday Book Review section. http://www.nytimes.com/2008/05/04/books/review/Prose-t.html (accessed 10/1/09). Wen-hsin Yeh, Shanghai Splendor: Economic Sentiments and the Making of Modern China, 1843-1949 (Berkeley: University of California Press, 2007), 213.